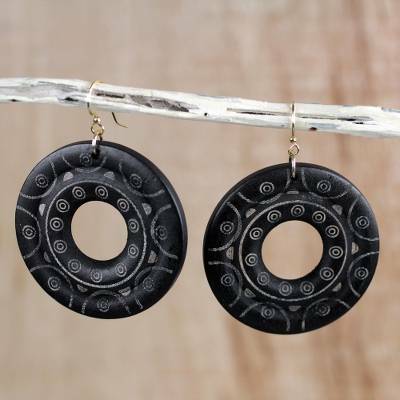 Handcrafted Round Sese Wood Dangle Earrings from Ghana, "Beautiful Rings"
Two beautiful rings are handcrafted in Ghanaian sese wood and painted with intricate circle motifs. Ali Mohammed designs this wonderful pair of dangle earrings, hanging them on brass hooks. You can find wood dangle earrings 'Beautiful Rings' by Ali Mohammed in jewelry categories such as No Stone Earrings, Wood Earrings and Dangle Earrings. Enjoy exploring these sections for other Novica treasures.